The following are some of the texts, acted parable stories, quotes and health studies we have gathered on our music reform journey. There are at least five principles of music that we can establish from the Bible. Exodus 32:17-19 And when Joshua heard the noise of the people as they shouted, he said unto Moses, There is a noise of war in the camp. And he said, It is not the voice of them that shout for mastery, neither is it the voice of them that cry for being overcome: but the noise of them that sing do I hear. 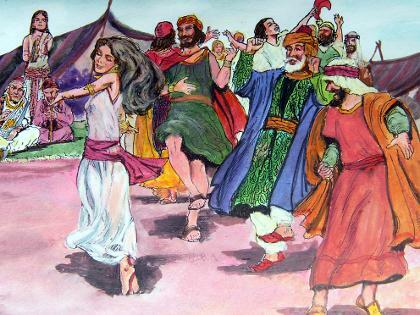 And it came to pass, as soon as he came nigh unto the camp, that he saw the calf, and the dancing: and Moses' anger waxed hot, and he cast the tables out of his hands, and brake them beneath the mount. 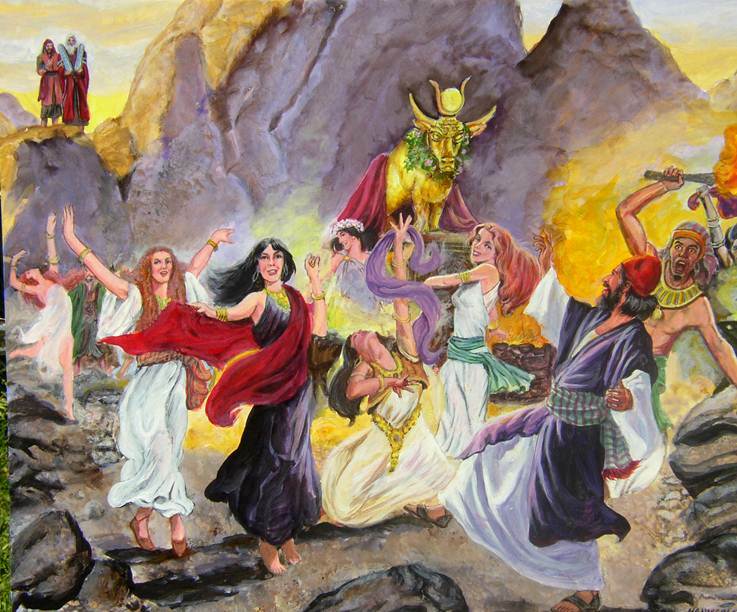 Notice that when Moses and Joshua heard and saw the apostasy of Israel at the golden calf, Joshua did not recognize the “music” of the heathen worship, evidencing the fact that this was different from what was regularly used in the worship of God. On the other hand, Moses, who had grown up in the Egyptian court, recognized it immediately. “By faith Moses, when he was come to years, refused to be called the son of Pharaoh's daughter; choosing rather to suffer affliction with the people of God, than to enjoy the pleasures of sin for a season; Esteeming the reproach of Christ greater riches than the treasures in Egypt: for he had respect unto the recompense of the reward.” (Hebrews 11:24-26) We should be aware that just because we find something pleasurable does not mean it isn’t sin. On the other hand, Moses, who had grown up in the Egyptian court, recognized it immediately. “By faith Moses, when he was come to years, refused to be called the son of Pharaoh's daughter; choosing rather to suffer affliction with the people of God, than to enjoy the pleasures of sin for a season; Esteeming the reproach of Christ greater riches than the treasures in Egypt: for he had respect unto the recompense of the reward.” (Hebrews 11:24-26) We should be aware that just because we find something pleasurable does not mean it isn’t sin. Notice also that this music sounded like war, and was connected to lewd dancing involving nakedness. The Bible records that “…Moses saw that the people were naked...” (Exodus 32:25) Still today, this music is played in clubs and bars to remove the natural inhibitions of people. The origin of the term rock 'n' roll is worth noting. In the early 1950s, a disk-jockey named Alan Freed had been receiving reports concerning kids' strange reactions to this "new" music, so he decided to name it after a ghetto term used for fornication in the back seat of a car, hence the vividly descriptive term "rock 'n' roll" was coined. Jazz is characterized by its eccentric noises [uncertain sounds], while rock may be recognized by its overpowering rhythm element, syncopated beat and polyrhythms. If you have a small untrained (and unperverted) child clap their hands to a song, the correct rhythm is what they would naturally clap. Another way for an amateur to recognize syncopation, is by noticing—does it make you want to swing your hips or make you want to march forward. March style rhythms help to maintain order and thus are used in military training. Syncopated rhythms—those that make you want to swing your hips-- are inverted from the natural rhythm and they contribute to the lustful behavior before mentioned. Even if the rhythm is very light, if it is on the “off-beat”, many have found this statement to be true. "Soft rock" is like soft liquor, it leads to the harder stuff as the addiction increases. (Raymond Obomsawin) Cymbals and other percussion instruments may be rightly used to emphasize certain points in music without the repetitive polyrhythms. There is another counterfeit method of music to be addressed that is almost entirely the opposite of rock. It has no real rhythm and is often termed “New Age”. The Bible says, “But when ye pray, use not vain repetitions, as the heathen do: for they think that they shall be heard for their much speaking.” (Matt. 6:7) Many pagan religions use repetitions to create a hypnotic trance. This may also be achieved by music that contains no rhythm and is very repetitive. This extreme of music should also be avoided for God commanded in Jer.10:2 “Thus saith the LORD, Learn not the way of the heathen…” and Deut. 18:9 reiterates, “…thou shalt not learn to do after the abominations of those nations”. Let us desire instead the music of heaven. Studies on plants--In the book Stop, Look and Listen the authors tell this story. “”Mrs. Retallack, aided by Prof. Francis Broman, conducted scientifically controlled experiments with music and plants. She placed several groups of five assorted potted plants in closed portable cabinets in which light, temperature, and air could all be regulated automatically. Each cabinet had a sound speaker secured to one side. “”One group was exposed to Denver’s rock music station (KIMN) and another to a semi-classical station (KLIR). “The petunias ‘listening’ to rock refused to bloom. Those on KLIR developed six beautiful blooms.” After two weeks, the KIMN flowers were all leaning away from the speaker and showed erratic growth. They were all dead in a month. The KLIR flowers in two weeks were all leaning toward their speaker. Later, I met the authors of this book. They regularly played classical/sacred music to their own garden and assured me that the plants did indeed grow toward the speaker. In fact, Israelite men began bringing the Midiantish women into the camp. Numbers 25:1-5 And Israel abode in Shittim, and the people began to commit whoredom with the daughters of Moab. And they called the people unto the sacrifices of their gods: and the people did eat, and bowed down to their gods. And Israel joined himself unto Baalpeor: and the anger of the LORD was kindled against Israel. And the LORD said unto Moses, Take all the heads of the people, and hang them up before the LORD against the sun, that the fierce anger of the LORD may be turned away from Israel. And Moses said unto the judges of Israel, Slay ye every one his men that were joined unto Baalpeor. But there is more to this story than what is on the surface. Numbers 25:6-13 And, behold, one of the children of Israel came and brought unto his brethren a Midianitish woman in the sight of Moses, and in the sight of all the congregation of the children of Israel, who were weeping before the door of the tabernacle of the congregation. And when Phinehas, the son of Eleazar, the son of Aaron the priest, saw it, he rose up from among the congregation, and took a javelin in his hand; And he went after the man of Israel into the tent, and thrust both of them through, the man of Israel, and the woman through her belly. So the plague was stayed from the children of Israel. And those that died in the plague were twenty and four thousand. And the LORD spake unto Moses, saying, Phinehas, the son of Eleazar, the son of Aaron the priest, hath turned my wrath away from the children of Israel, while he was zealous for my sake among them, that I consumed not the children of Israel in my jealousy. Wherefore say, Behold, I give unto him my covenant of peace: And he shall have it, and his seed after him, even the covenant of an everlasting priesthood; because he was zealous for his God, and made an atonement for the children of Israel. Now the name of the Israelite that was slain, even that was slain with the Midianitish woman, was Zimri, the son of Salu, a prince of a chief house among the Simeonites. Now comes the really interesting part. Look at the meanings of these names. Num 25:14 Now the name of the Israelite that was slain, even that was slain with the Midianitish woman, was Zimri,[musical] the son of Salu[weighed, also Hitchcock-an exaltation, a basket], a prince of a chief house among the Simeonites. Num 25:15 And the name of the Midianitish woman that was slain was Cozbi[false], the daughter of Zur[rock]; he was head over a people, and of a chief house in Midian. Zimri, meaning musical, commits fornication connecting him to Cozbi, the daughter of Zur meaning false, the daughter of rock. Deut 32:31 says, For their rock is not as our Rock, even our enemies themselves being judges. Deut. 32:37 continues, And he shall say, Where are their gods, their rock in whom they trusted. It seems today, on the borders of the promised land, the story is being repeated. False worship, the offspring of rock is being connected with music in the camp of spiritual Israel today. The question is, who, like Phineas, will stand up against it to save others from being beguiled? Numbers 25:16-18 And the LORD spake unto Moses, saying, Vex the Midianites, and smite them: For they vex you with their wiles, wherewith they have beguiled you in the matter of Peor, and in the matter of Cozbi, the daughter of a prince of Midian, their sister, which was slain in the day of the plague for Peor's sake. Who will put forth effort to destroy the apostasy before it is too late?